Every Friday morning from 9 to 10 am from april to october, Anais invites you to practice Yoga on the terraace of les Charmettes . She will teach relaxation techniques, meditation postures and Yoga deep breathing. Special rate for Les Charmettes guests : 10 euros, pleae note : the class can be cancelled in function of the weather forecast. Ask for details at the reception desk. Vélo Emeraude is in a position to offer bikes at Les Charmettes. 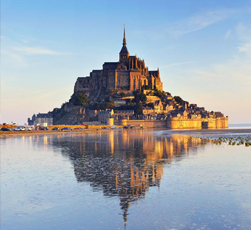 We suggest the route from Les Malouinières to St Malo to marry culture and cycling, or head eastwards to Cancale and Mont St Michel, or to the West to Dinard or Dinan. Booking 24/48 hours in advance. St Malo’s Surfschool is open all year round for children and adults alike, introducing you to winter sports and sailing sports such as sand yachting and paddle walking – suitable for all ages and especially for first-timers looking to get away from it all for an hour. Our personal favourite is obviously Chausey (no, it’s not an English island!) for the day, as it isn’t very big. This archipelago is really marvellous, with its exotic flora, its “grandmother” gardens and stony landscapes; 365 islets can be seen at low tide, compared with 52 at high tide. It’s an earthly paradise for hikers and fishermen, where you will find a small chapel, mini market and a pretty restaurant hotel. At Les Charmettes, we can make you a picnic for the day. Alternatively, a stroll along the coast to catch sight of St Malo could do very nicely, or a crossing over to Dinard for the market that runs there on Tuesday, Wednesday and Saturday morning. Imagine staying at Les Charmettes and being pampered all day by a massage treatment with essential oils, a course of Aquatonic jets and bubbles, being enveloped in locally-sourced algae, or having a feminine Silhouette treatment and going home feeling relaxed with inches off your waistline! Treat yourself – but in a place that feels like home. The Aquarium de Saint-Malo to explore the shark ring or to go down into the world of deep-sea fish. The “Train Marin” a covered tractor, no less! 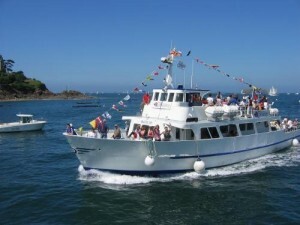 – that will take you to the traditional fisheries in the bay of Mont St Michel at Cherrueix. The walks led by Yann to explore the ecosystem of St Malo’s flora and fauna along the coast (sign up at the St Malo tourism office). The workshop of the sculptor Manoli , who turned materials he collected into giant pieces or animals. The Marine Farm in Cancale, where you will learn about the life of the local oyster farmers. International Trophees for the film made by the Charmettes: (The magic relies on you) !